On March 22-23, The New Community School transforms its gym into a pop-up art gallery, showcasing the works of both well-known and up-and-coming artists. The 11th annual READ (Raising Educational Awareness for Dyslexia) Art Show & Sale is a fundraiser that presents over 100 local and regional artists all in one space. The North Side school has served fifth- through 12th-grade students with dyslexia and related learning differences since 1974. This year, the featured artist is Andras Bality, a modern impressionist who received a Pollak Prize from Richmond magazine in 2013. “As an artist it’s a wonderful opportunity to present work to a large audience who may not otherwise see it,” Bality says. Other regularly participating artists who exhibit nationally and internationally include Holly Markhoff, Diego Sanchez, Frankie Slaughter, Cynthia Erdahl, Curney Nuffer, Laura Loe, LeeAnne Wright and READ founding artist Susan Dull. “Each year we get better and better artwork in terms of variety and talent,” says Jennifer Miller, who plans the event and has two sons enrolled in the school. While many of the artists exhibit on a large scale, some are less well-known, including Virginia Commonwealth University college students and members of The New Community School’s senior class. That diversity of artists means the show has something for every budget. “Prices range from $50 to $4,000, with an average of just under $300,” Miller says. The art show includes a ticketed preview event with music from Little Known Legends and food on Friday evening. On Saturday, the sale runs from 10 a.m. to 4 p.m., and admission is free. The work of Local Artist, Holly Markhoff comes to Chasen Galleries and will be on view from August 18 through August 31st. Holly's work is expressionism meets figurative with beautiful feminine faces and forms among seas of abstract flowers and homey back drops. 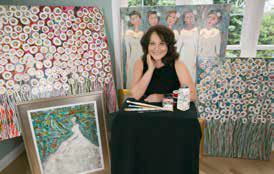 A contemporary mixed media artist known for her emotive figurative and expressionist paintings, Holly Berger Markhoff’s stunning paintings are now on exhibit at Richard Stravitz Sculpture & Fine Art Galleries in Virginia Beach. Influenced by the elongated figures of Modigliani and the gilding of Klimt, her painting incorporates sculptural elements and a variety of mixed media. Acrylic, enamel, and metallic paints are built up between layers of acrylic gloss, creating a glass like coating and translucence. Markhoff obtained her bachelor of arts degree from Virginia Commonwealth University and has participated in Israeli visiting Artist-Study Intensive, as well as other workshops and programs. 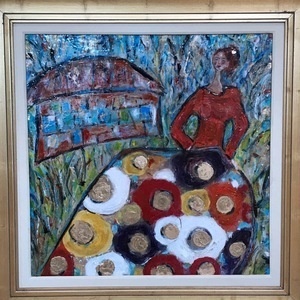 Among the many places her art may be found, in addition to patrons’ homes and corporate collections are in Richmond’s Weinstein Jewish Community Center and Beth Ahabah Museum and Archives. A native of New York City, Markhoff resides in Richmond, Va. Stravitz Sculpture & Fine Art Galleries is located at 1217 Laskin Road in Virginia Beach. 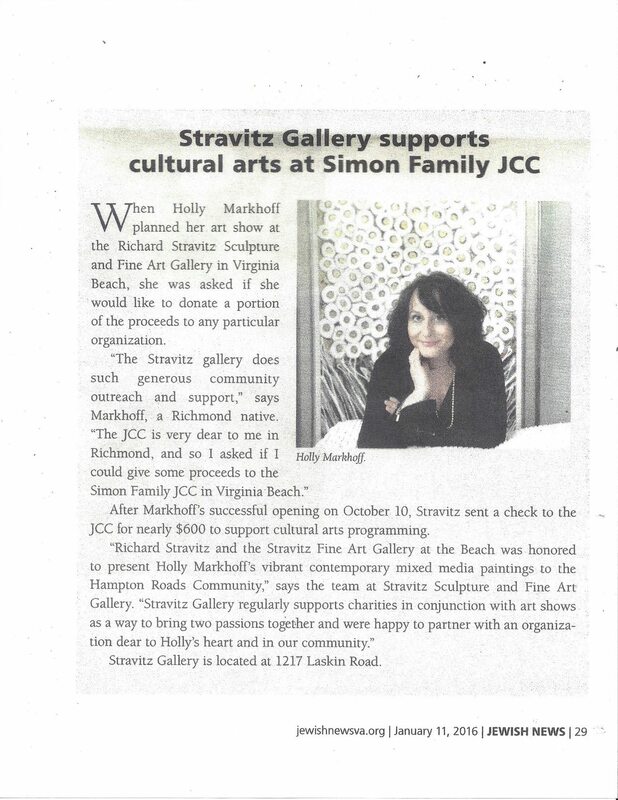 Call 757-305-9411 or go to www.stravitzartgallery.comfor more information. Season SponsorSwift Creek Mill Theatre is proud to present Holly Markhoff, a contemporary mixed media artist, as our Featured Artist during the production run of The Little Lion from January 28 through March 5, 2016. Please join us for a performance of The Little Lion and enjoy Holly’s artwork in The Mill Room during dinner/lunch or during intermission of the performance. Click Here to read more about Holly and her artist story. HOLLY BERGER MARKHOFF is a contemporary mixed media artist. Born in New York City, Holly grew up outside of Washington DC, in Alexandria, Virginia. She currently lives in Richmond, Virginia with her husband, two college age children, and two dogs. She has a studio in her home, and in the city’s Museum District. As a side note, Holly was involved in theater arts as a teenager and child, including productions at the Little Theatre of Alexandria, and as a member of a touring pantomime group, which put on over 40 shows in one summer! Holly is honored to have her work shown in the renowned Swift Creek Mill Theatre, coinciding with the esteemed stage debut of Little Lion! Public invited to help create artwork 4 to 6 p.m. This February, Gallery 66 NY will participate in the village’s daylong Winter First Friday, sponsored by the Chamber of Commerce. As part of the festivities, Gallery 66 will have the public create a piece of art with “snowball pigment throws” from 4 to 6 p.m., Feb 6. For a list of the activities throughout the day, visit the Facebook page of the Cold Spring Area Chamber of Commerce. The opening reception of Show the Love will follow at 6 p.m., featuring 30 artists who live and work in Cold Spring, including Thomas Huber, whose unrelated drawings and imagery utilize natural and biological forms; Russ Ritell, whose social and political graphic work of the punk scene creates a raw edginess in his paintings; Richard Bruce, whose paintings reflect the essence of nature and its abstractions; and works of Carl Van Brunt using digital fractal repetition to create otherworldly abstract images. All 30 artists, in keeping with the “love” theme of February, will feature works that celebrate the “rouge” tones of red, purple and pink. The month of love is also celebrated in the back gallery with Puttin’ on the Ritz, paintings by Holly Markhoff. Through her use of acrylic, oil or mixed media with paints, paper and layers of gloss, she creates a translucent glassy effect with many of her paintings. The exhibit will be on view Feb. 6 through March 1, with an artist’s reception Feb. 6 from 6 to 9 p.m. Regular winter hours are Thursday through Sunday, noon to 5 p.m. For more information, call 845-809-5838 or visit gallery66ny.com. Nov 9, 2013 - Posts about Holly Markhoff written by richardstravitzsculpture.